The imaging platform includes a last generation wide-field light microscopy equipment for high-resolution analysis of live samples, an up-right microscope delivering crisp, clean and true-to-life images of fixed fluorescent cell samples and an image analysis workstation. Imaging capabilities include: time-lapse recording of live cells over several days; detecting intracellular molecular interactions; reconstructing cellular and subcellular structures at 3D level obtaining quantitative information on the molecules or cells that are being imaged. 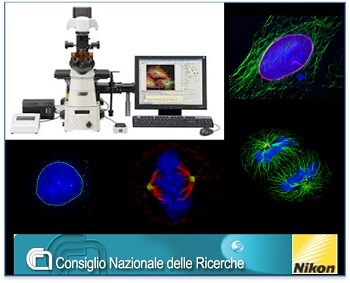 Imaging methods are developed in collaboration with Nikon, e.g. for automated image acquisition and analysis.